Edna Lewis was a chef and cookbook author born in 1916 in Virginia. I think her second cookbook, The Taste of Country Cooking, is an absolute staple and works to preserve classic Southern cooking. If you are talking about female chefs who impacted and paved the way for younger female chefs, Edna Lewis comes to my mind and there is no recipe more Southern than the buttermilk biscuit. 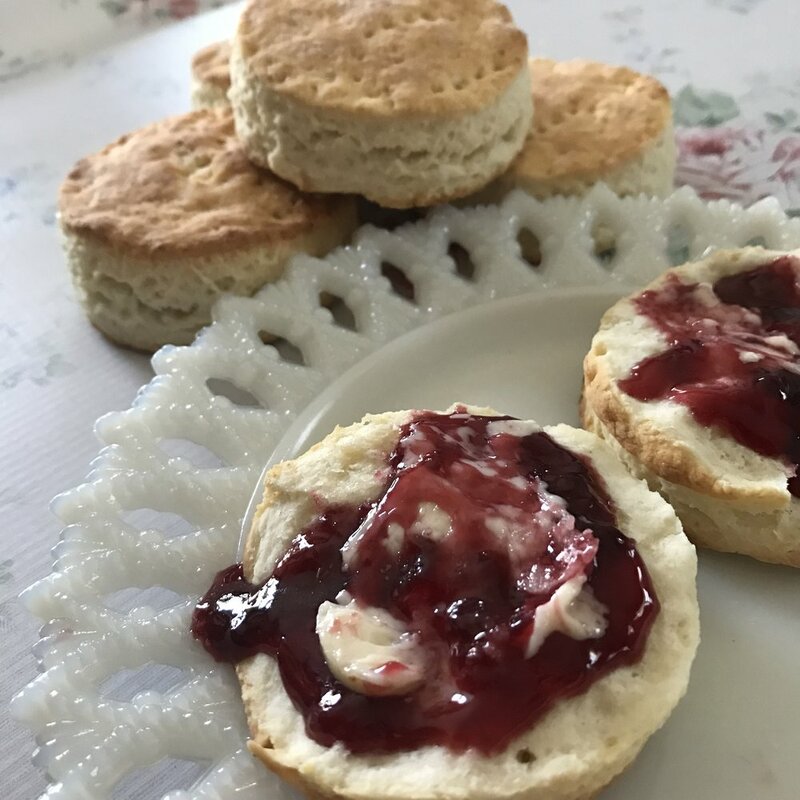 Classic biscuit recipes, for the most part, have many similarities and it really comes down to tiny little differences to make an outstanding treat. White Lily brand was named in the recipe. Edna’s recipe calls for the flour to be sifted and then measured. Most of the time I don’t use recipes to bake. I use ratios and develop the recipes myself. I have also been a lazy sifter and use a whisk to aerate the flour. Well the first time I tried Edna’s recipe, I skipped the sifting and the result was a super dry biscuit because of the amount of flour. The next time I made the recipe, I reduced the amount of flour, and still skipped the sifting and the resulting biscuits were a buttermilk delight! Edna’s recipe called for piercing the rolled out dough with a fork. It helps the biscuits rise evenly and create a flat top that is golden and consistent. Edna’s recipe also called for very cold lard or shortening. If you forget to place the shortening in the refrigerator, you can spread it onto a plate and place it in the freezer for 30 minutes to get it nice and chilled. The major difference I noticed in Edna’s recipe was the oven temperature. She baked her biscuits at 500 degrees! I normally bake them at 425 degrees and even that I consider high! "Cut" in the shortening with your fingers. Add the liquid and mix by hand until the dough comes together. Turn the dough out and knead it 6 to 7 times. Bake on a cookie sheet until golden. Slather with butter and jam and enjoy! To update this classic recipe I really only made three changes: I used less flour so I could skip the sifting, I added a touch of sugar, and I re-rolled the dough once to get a greater yield. They are small differences, because truthfully Edna’s recipe is pretty much perfect. 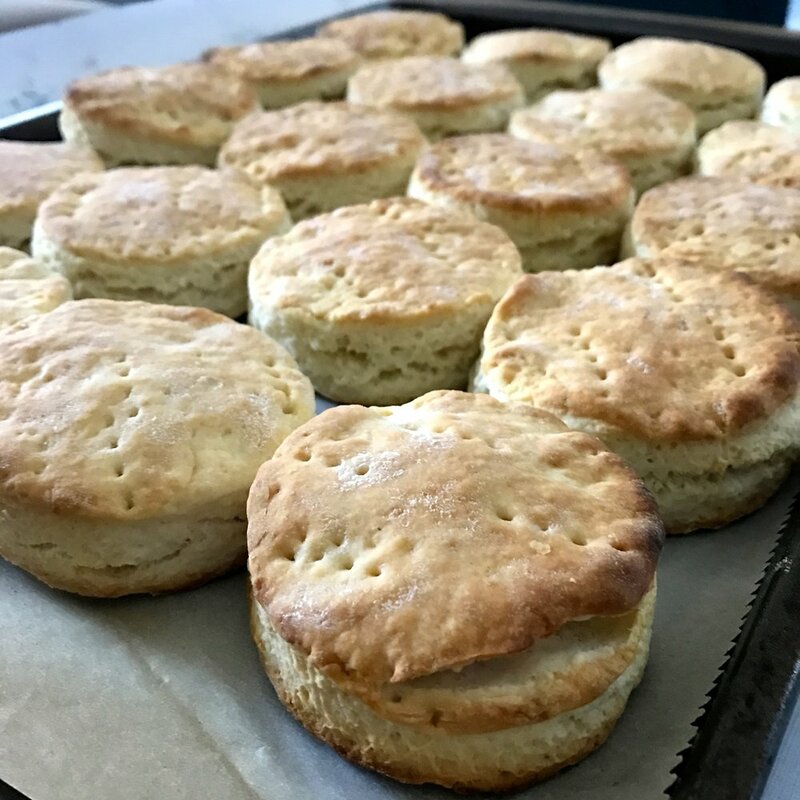 So, If you are looking for your very own classic buttermilk biscuit recipe that tastes like it was made by a Southern grandmother, then this is the recipe for you. Preheat oven to 500°F. Add the flour, baking powder, sugar, and salt to a mixing bowl, and whisk well to blend thoroughly. 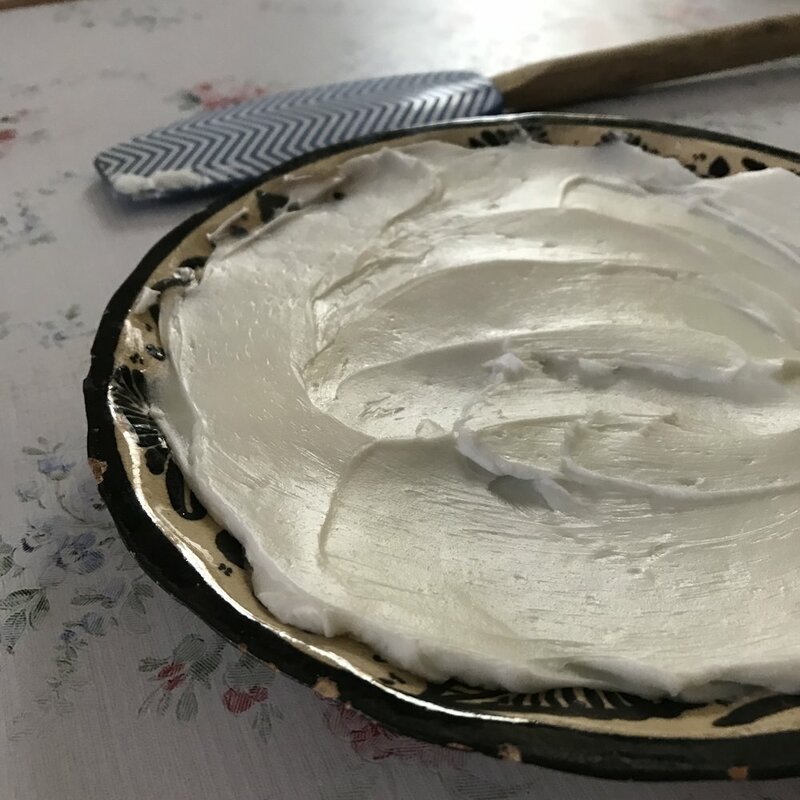 Add the lard, and working quickly, coat it in flour and rub between your fingertips until approximately half the lard is finely blended and the other half remains in large pieces, about ½-inch in size. Make a well in the center of the flour mixture and pour in the buttermilk, stirring quickly just until the dough is blended and begins to mass. Turn the dough immediately out onto a floured surface, and with floured hands, knead it briskly eight to ten times, until it becomes cohesive. Gently flatten the dough with your hands into a disk of even thinness. Then, using a floured rolling pin, roll it out to a uniform thickness of ½ inch. With a dinner fork dipped in flour, pierce the dough completely through at ½-inch intervals. 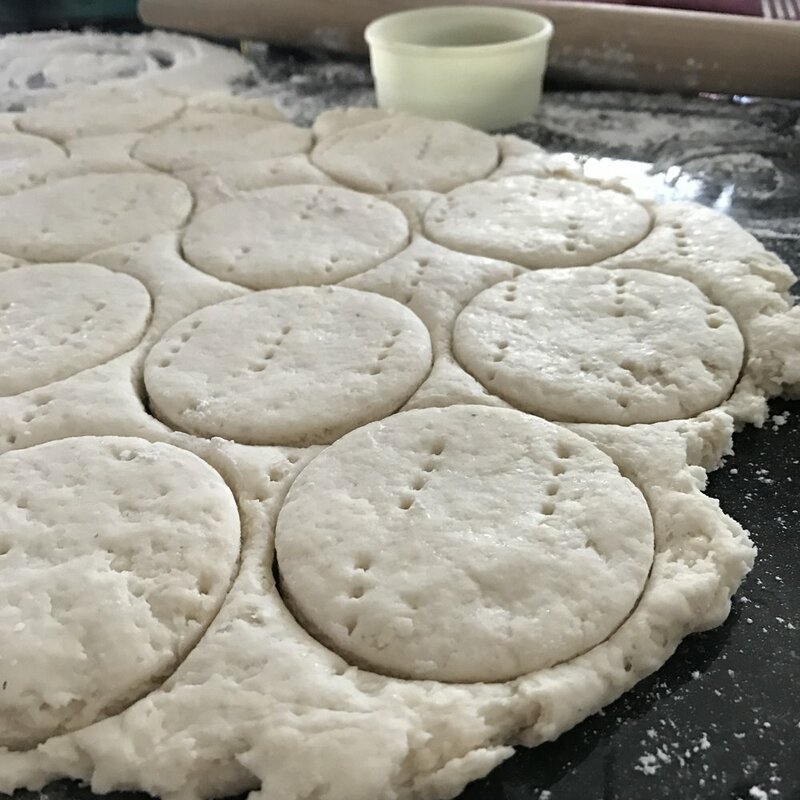 Lightly flour a 2½- or 3-inch biscuit cutter and stamp out rounds, without twisting the cutter in the dough; cut the biscuits from the dough as close together as you can, for maximum yield. Transfer the biscuits to a parchment-lined baking sheet, placing them so that they just barely kiss. Re-roll the scraps once. Repeat the steps for cutting. Arrange any leftover scraps around the edge of the sheet to bake (cook's treat!). Bake the biscuits 10 to 12 minutes, checking them after 6 minutes or so, and turning the pan if needed for even baking. When the biscuits are golden brown, remove them from the oven and brush the tops with the melted butter.